The Brewery is currently housed in what was previously a farm shed, on the old family farm. 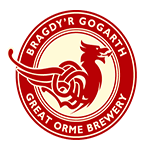 It currently employs three people and distributes beer across North Wales. I worked for 10 years as a management consultant specialising in the food and drinks industry, what is commonly referred to as the FMCG sector. During my time as a consultant I had the opportunity to work with some of Europe’s largest and most successful food manufacturers. This all lead me to the conclusion that at some point I wanted to practise what I had preached. Therefore on a rather soggy commute to work I hatched a plan of opening a brewery. And after two years of planning and experimentation the first commercial brew was produced. I think my background working within the food industry coupled with the fact that my parents were approaching retirement with the prospect of the family farm becoming redundant convinced me that I could do something worthwhile with the old farm. I guess many people dream of opening a brewery so one day I thought I should do it rather than just dream of it. The family farm overlooking the Great Orme, from which it gets its name. 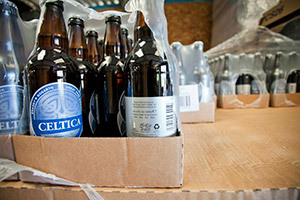 The brewery currently has a capacity of around 4500 litres a week, or 30BBL a week. I guess the fact that we produce a lager is different to many micro-breweries of our size. 1085 is a premium lager brewed using Snowdonia water (which is a clue to its numeric name!) It’s been a success for us and was created out of the desire to bring a little micro-brewing passion to the lager market. We brew it the old fashioned, and time consuming, way, and it tastes all the better for it! I would also say that at Great Orme, we are very open to customer and industry feedback and this conversation is something we plan to grow and invest in over the coming years. This is usually a conversation between me and the brewer, however what I would like to do is open up our R&D to consumers and people who are passionate about making good beer and see what interesting ideas we can come up with together. Beer is so subjective, but with hand on heart I think we make good tasting beer that’s well balanced. We don’t necessarily force acres of hops into our beer, or make it unfathomably strong but I believe we do produce well balanced beers of the highest quality using our local Snowdonia water. No, I don’t create them specifically for a market, we create beers that we think will be fun to brew and taste great. Yes, what sort of brewer would I be if I didn’t enjoy my own product? The only downside about being a brewer is that you spend ages analysing a pint be it mine or somebody else’s with a critical eye, trying to analyse it and break it down. It’s very difficult to say which is my favourite, it depends on my mood, the season and 101 other things. Have we had any disasters? Yes, we developed a White Beer once and added cloves. Unfortunately the cloves took over and it ended up tasting like clove juice. We ended up throwing that batch away but undeterred we tried a second batch that was pretty good white beer. Not on the brewing side but we do co run a pub in Conwy, called The Albion, with three other local breweries. We think this is the first time in the world where four rival breweries have joined forces to save a local pub. Wow. There are so many good breweries in the UK and beyond. I guess I’d have to say Steve Wellington of Bass and Worthington White Shield fame. He’s acted as a technical mentor, helping us out when needed and I regard him as one of the best. … I’ll get back to you with a third… more research needed!!! 1. We, as a company, need to take the lead in developing an open transparent business which genuinely communicates with its customers and in doing so asks its customers to affect what we produce in the future. 2. The alcohol industry keeps telling the consumers to drink responsibly but I think there is a debate to be had on whether the alcohol industry acts responsibly itself. Therefore I want to develop a drinks business that takes its share of responsibility for improving the society in which it operates and hopefully encourage other businesses within the sector to do the same. Full of good beers. I think the introduction of beer duty relief as resulted in the UK being one of the most dynamic and fertile brewing nations on the planet, and frankly I think there’s still a long way to go. I imagine the UK beer market will have developed still further in another 20 years. At the moment we’ve got a wide range of beers produced in the UK but they all follow a similar traditional ale / bitter style. I can envisage a widening of beer styles maybe including styles that as yet are relatively unheard of in the UK. This has probably started already with the wider availability of Belgium beers, weiss biers and better quality premium European pilsners, however there are so many other styles, either from the US or Europe that I’m sure will be seen over here in due course and the natural next step is for us to emulate them, adapt them and brew them her in the UK. The one area of the UK beer industry that frustrates me is the pubs. If we’re not careful we are going to lose a major part of our cultural heritage through the demise of our pubs in the UK. The success of the microbrewery industry has proven without any doubt that consumers are looking to buy local products, yet apart from some efforts by SIBA and the DDS scheme it is very difficult to get beers into the tied pub market. Surely the viability of the remaining pubs can only be improved by relaxing the tied estate rules and allowing landlords to ‘buy out’ from other breweries at market costs? I believe this would lead to a better business for everyone, pubco’s included. CAMRA have undoubtedly been a driving force in the success of the beer industry since its inception some 40 years ago, I believe the focus of CAMRA probably needs to move away from supporting breweries to supporting the viability of pubs and ensuring that our pubs have a long term future, unshackled by unsustainable rents and inflated beer prices. As for SIBA, it’s efforts in developing the direct delivery scheme (DDS) have made some headway in tackling the problem mentioned above and it acts as a useful forum with which brewers can communicate with others in their industry.